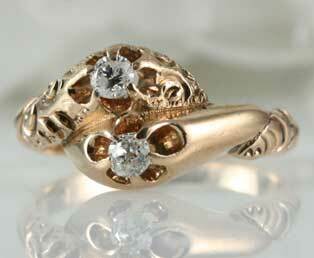 Fascinating antique Victorian snake ring featuring double diamonds. This Victorian serpent ring is designed to coil around the finger. An engraved head shows the details of a snake's eyes and open mouth. A smooth tail may be found wrapped closely to the snake's head. Two diamonds held slightly above the snakes head and tail embellish the design of this ring that was made in 14kt (585) yellow gold. During the reign of Queen Victoria serpent jewelry was extremely popular. Queen Victoria was given a snake ring as an engagement ring by her husband to be, Albert. During this time period snake or serpents symbolized eternal love. Snake motifs could be found in rings, bracelets and brooches.